Steve over at Big Mess O’ Wires wrote up a nice review of our Blinky POV kit. A few excerpts are below, you can read the whole thing at the Big Mess O’ Wires blog post. My oldest daughter Alice has an occasional interest in electronics, and as her dad I try to encourage her without becoming too annoying. We’ve done some past projects like Snap Circuits experiments, building a Drawdio pen, and constructing an animated Halloween LED display. Recently we had a chance to build a Blinky POV from Wayne and Lane. Or more accurately I should say she had a chance to build it, since my role was limited to talking her through the steps and taking photos. 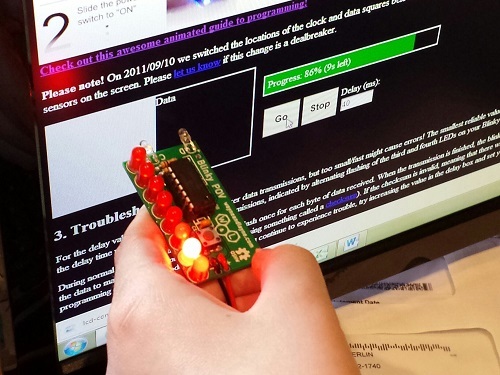 It’s impressive what an 11-year-old can do with a soldering iron! This is starting to sound like a Wayne and Lane commercial, so I should probably add that I have no affiliation with them other than being a satisfied customer. If there’s a young builder in your life who might enjoy a simple but fun-filled electronics project, give Blinky POV a try. Nice kit! After reading Steve’s blog, I’m thinking about buying one to build with my 11 year old daughter. LOVE the programming interface! Much better than having to change the code & reprogram the PIC. Thanks, we’re really proud of the optical reprogramming interface, glad you like it! Very awesome Blinky Grid SMT. I put together this Blinky SMT Grid from you guys and it is awesome! I got the red one. Thank you very much for designing these cool kits. I will definitely buy more kits from you.